Discussion in 'iPad Accessories for iPAD 1, 2 and 3' started by Shield, May 25, 2011. Hello, can you guys suggest the best external speakers for the Ipad 2? I'm thinking it's better to purchase an all in one unit that will charge the Ipad while it plays music, etc. Portable even better. Thanks in advance. If you want portability try the Jawbone Jambox or the x-mini ii. Both deliver awesome sound. The Jambox is Bluetooth or wired. Your choice. The Mini ii is an egg shaped spilt speaker that delivers terrific sound for the money. I actually wrote a review on the Jambox. You can find it at www.justanothergeeksite.com. Hope that helps. Cheers! Will the speakers work with ipad1? Yes - the iPad1 Bluetooth profiles support stereo speakers. The Jawbone works fine with either an iPad1 or iPad2. Of course, there's no problem with wired speakers either. 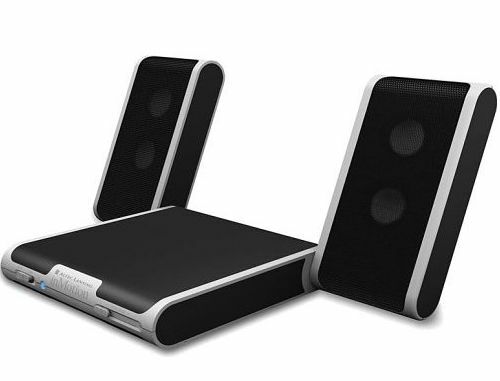 For a number of years I've traveled w/ a portable set of Altec Lansing speakers (image below) - wired and fold into a small compact unit for storage - not sure the company makes these any more, but still working and easily provides enough sound for a room. Now I've used my iPod in hotel rooms w/ radios having adapters for that device - convenient although the quality of the sound seems to vary considerably. So, I might be interested in upgrading since my music is now on the iPod (use to be on several laptops so a wired external set of speakers served me well). I've been reviewing Bluetooth headphones to use w/ the iPod - e.g. would be great for me when walking on a treadmill, however, the reviews have been variable as to the consistency & quality of the sound w/ this wireless technology (i.e. is it mature yet? ).